Location: In a terrace near the SE end of High Street, opposite Heol y Parc. Nos 1-9 High Street were built in the mid C19 and are shown on the 1871 Tremadog estate plan and 1888 Ordnance Survey. Built originally as shops with houses above, early photographs show the façade stone-faced, which was later concealed by slate hanging. No 1 was a printer's shop in 1886. One of a row of 4 late-Georgian style 3-storey 2-window shops with houses above. They have slate-hung fronts, a slate roof hipped to the R end (No 1) where the corner is also splayed, with transverse stone stacks and a fourth, pebble-dashed stack at the R end. The houses are not of equal width. No 1 is the widest, Nos 7 and 9 are narrower than No 3. No 1 has a replacement lower-storey window and replacement door to the R in a modern stone surround. To its R is a single-storey flat-roofed extension with slate-hung walls, and wide modern shop window under an awning. In the middle storey are 12-pane hornless sashes and in the upper storey shorter 9-pane sashes. The 2-window R end wall, facing Madoc Street, is slate-hung above a lower-storey dentilled cornice. It has 12-pane and 9-pane sash windows similar to the front. To the R of the 1-storey extension is a 4-pane hornless sash window in the lower storey. The rear, where Nos 3, 7 and 9 are set slightly back from No 1, is of rubble stone laid in rough courses. No 1 retains some sash windows and has a 1-storey projection under a single-pitch roof. 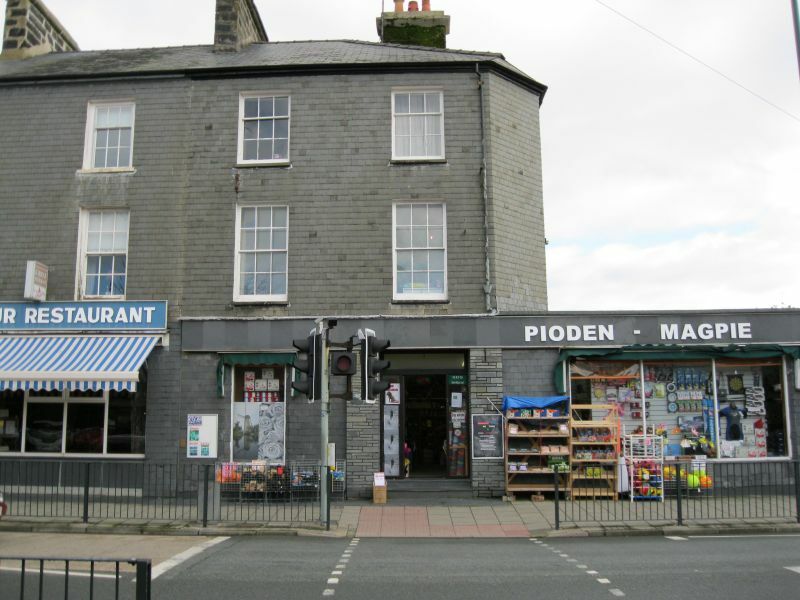 Listed for its special architectural interest as part of a short terrace of houses and shops notable for its distinctive use of slate-hanging and retaining definite C19 regional character, close to and making a visual contribution to the historical integrity of the harbour. Set back from the street and attached to the Co-op supermarket. On Oakleys Wharf, set well back from the quayside and beyond the N end of the former slate warehouse.